Most artists would love to know how to draw portraits. For me, it's something I work on continuously - I'm getting better even though it's a slow process due to my personal time constraints. 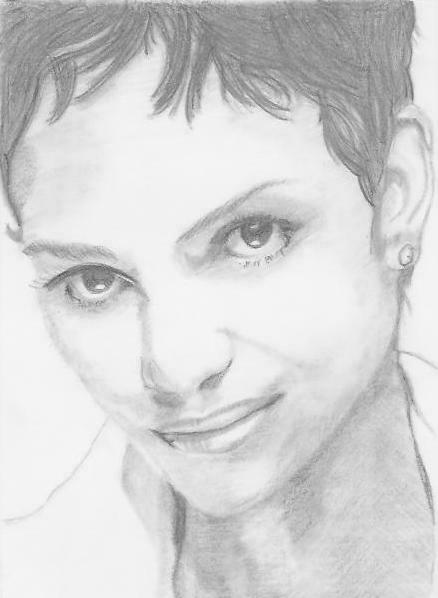 For assistance, I bought an online art book entitled - Learn Pencil Portraits in 7 Days. I have always loved to learn via a step by step process so this book appealed to me straight away. Just below you can see the drawing that I created just by following Christopher's steps. I haven't re-touched anything and, as you can see, I did an awful job with her hair. I now know what I did wrong but I'm not silly enough to try and fix this one, I'll just do another. The finished drawing took me a few hours to complete but I was blissfully unaware of time. I used the same pencils that Chris told me to use throughout the book. Now I wouldn't say the book is perfect but it did give me great guidelines to follow. It's natural for us to do things differently so I have noted on the pages which changes I would make. I will keep to Chris' general guidelines, just in a different order! I noticed that once I did this drawing, I had the confidence to do another portrait drawing. Everyone, I'd like you to meet my beautiful little granddaughter, Caitlin. I've been wanting to do this for ages but I just didn't think I'd be able to do her justice. This is my first attempt, I know I don't have her mouth right but I'm happy to do it again. Just by repeating the process I'm sure to improve. It's amazing how one little nudge in the right direction can dramatically improve your drawings! 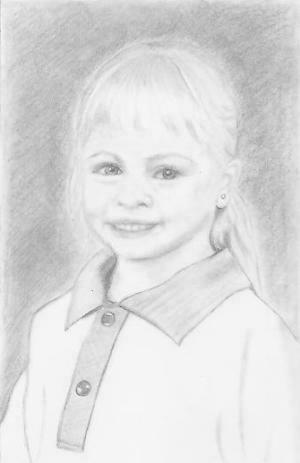 How To Draw A Portrait is reasonably priced and if you don't like it, there is a 60 day money back guarantee! Really, what have you got to lose?